Lord Duvel’s is the lord commander of the Canal’s army. During the recent events of the Broken god & the siege of Canal, Duvel stand firm not only in resolve but also as a steward of the Jewel of the North. After the battle and with the help of the Heralds a new emperor took his rightful place leading the costly victory of the empire forces. Well today discussion was about mathematics & Dungeon Questing. I suppose that you will wonder what a combination of themes is that. 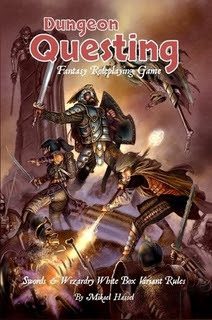 A beautiful RPG, such as Dungeon Questing, with the science of math. If you are familiar with DQ is a classless RPG system based on skills and also is based on White Box rules. Before i get my hands on the printed books i didn’t believe that such a combination will ever exist, but Mikael Hassel did his miracle.